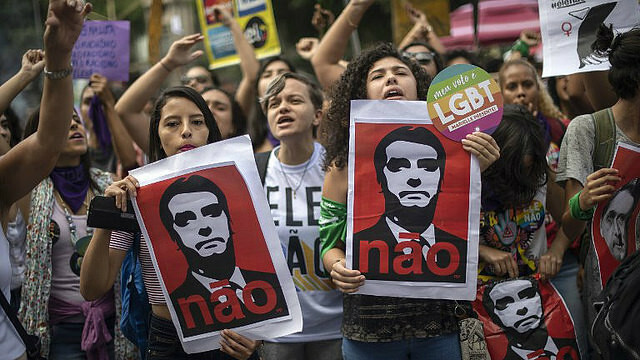 The Brazilian people who are unhappy with the rise of the far-right to power in Brazil will take to the streets on Tuesday to protest against the democratic rupture represented by the election of Jair Bolsonaro last Sunday, after he won 55 percent of votes. While around 58 million voters chose the retired army captain, 89 million Brazilians did not elect his conservative project, including those who voted for Fernando Haddad and a high absenteeism rate. Six demonstrations will be held this afternoon, in São Paulo, Fortaleza, Brasília, Porto Alegre, Recife, and Rio de Janeiro. We lived an entirely atypical electoral process. Since the end of the military period, we have not had the political imprisonment of a leader, such as Luiz Inácio Lula da Silva, who was unjustly convicted and whose candidacy was contested by the Superior Electoral Court. A process in which forces that had so far operated in the undergrounds, have emerged in the presidential dispute provoking a great wave of hatred and violence against the Brazilian people. The election of Bolsonaro represents a political rupture, whose signs are represented in the murder of Marielle, of Moa Katendê - black leader, capoeirista in Bahia, Charlione - a young man from Ceará who was taking part in an election parade in support to Haddad’s candidacy. They threaten our lives because we fight for an equal and just country. These forces, through deception and truculence, with maneuvers still subject to investigations, arrived at the Presidency of the Republic. Despite so many obstacles, our alliance organized a powerful resistance throughout the country, which led to the realization of the second round and a formidable movement in defense of civilization against barbarism, democracy against dictatorship, love against hate.